Invisible ties by Nadya A.R. is the story of Noor and her struggles in rediscovering herself. The book has received great ratings and reviews including some highly-encouraging words from renowned people. And, as soon as you turn a few pages you’ll understand why. The words are visible. The description of the settings and people and everything else is so picturesque that you immediately drown in its magic. Story revolves around Noor who is bound in a loveless marriage. As she tries to move forward in her life, her tragic past comes to haunt her. A little comfort comes in the form her studying of psychotherapy and having friendship with Jake and Ella. It’s about Noor’s struggle with her past, and breaking bonds of traditions. It’s about love, tragedies, and betrayal. The plot itself is full of mystery, suspense, emotions and drama, while the story reveals itself layer by layer, switching between past and present. Author has an excellent command at story-telling gripping you right away. With such poetic prose and detailed description, it’s so easy to picturise the scenes and connect with them as if you’re living those events yourself. Vocabulary used is strong but interesting, while the language itself is smooth, flowing and exquisite. With so much happening and ability to make you live each of the moment it’s apparent to connect to the storyline as well as character. With layers peeling off and diving deeper into the lives of the characters, you feel quite connected, particularly Noor—the protagonist, Daisy and Lily. Only thing that troubles me, however, is that at several places the over-description becomes a hindrance in understanding what’s going on. The heavy prose comes between the storyline, breaking continuity. The over-usage of adjectives and metaphorical language makes you lose your patience. You either have to focus hard and keep patience or skip through pages of long detailed narration. Overall pace of the story tends to get slower and even stagnant at places, but the complexity of the storyline and heavy prose makes for it. 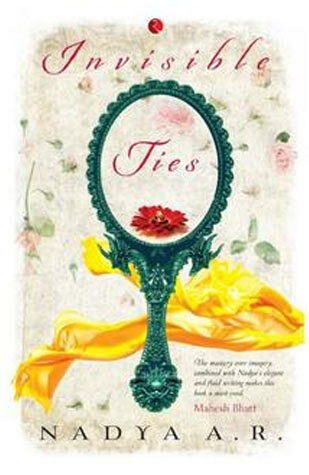 Invisible Ties by Nadya is a must-read book with interesting plot, excellent writing style, poetic prose, invigorating narration, intense vocabulary and well-built, likable characters. All in all, a great piece of contemporary fiction. Recommended for all the fans of literature.